The rainiy season is approaching here in Maban. This week already we had two thunder storms which only lasted about an hour but from the amount of rain that fell I can see why people tell me to prepare for mud and floods when such showers will become a daily occurence. The picture below was taken just after 10 minutes of rain! Of course the rains are welcome and necessary to sustain life here. They allow for crops to be planted and grow. They allow for a plentiful supply of water when boreholes are drilled. The rains too replinish the river Nile with all the life sustaining power of that great river. The rains also bring some cooler air which means we wont have to live with tempratures in the high 30s all the time. But rains that last for months also create problems. 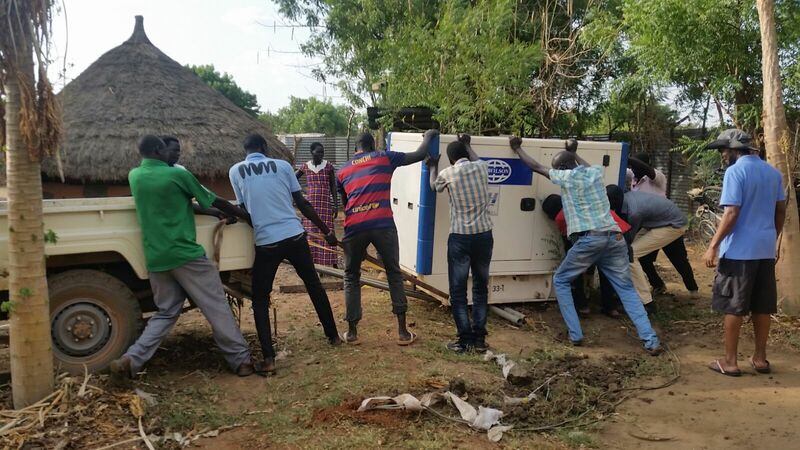 One problem I was anticpating was the fact that the generator in our compound was simply sitting on the ground which is fine in the dry season when the earth is as hard as concrete. But when the rains come I feared the heavy generator would sink into the ground and so damage this valuable piece of equipment. It is even more valuable to us in the coming season - most of the energy we use these days is solar power, but the generaror will be needed more and more as blue skies and sunshine is replaced by cloud and rain. So I had a concrete base built close to office. That was relatively easy. The challenge was - how do you move a generator that weights a few tons the 200 metres and place its on its new concrete base ? We dont have any specialiased lifting equipment, but we have a pick-up truck, some rope and a 'Maban Meitheal'. This meitheal was made up of watchmen, drivers and teachers. ( and the Project Director.. see the photographic evidence!) I must confess that I was secptical that this would work. Yes we had a pick up truck, but I was not at all sure that we could load the weighty beast of a generator onto the pick-up truck and then once loaded I was equally unsure if we could unload it, without injury to persons or the generator. Thomas is a our normal go-to electrician. 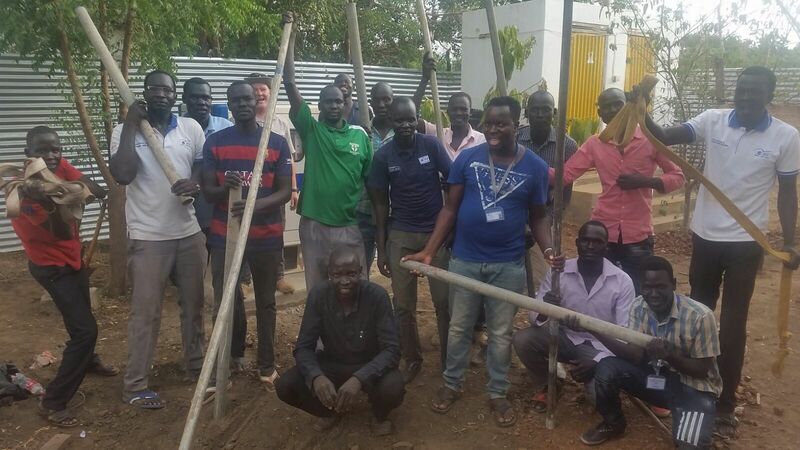 Displaced by the war with Sudan he had left South Sudan for safety and he learnt his trade with the Salesian Fathers in Khartoum - the capital of Sudan. His story is just one of many that is a reminder that ths land has been at war for far too long. Thomas arrived Friday morning and spent most of the day disconnecting the generator and connecting various bits and pieces ( junctions boxes and such like) at the new location. It was after 5 pm before we were ready to begin the move. What encouraged me in beliveing that we would suceed was the fact the so many of our team had willingly waited and were still waiting after 5pm. Some had come in on their day off to help. There was a vague plan to make a ramp out of two metal pipes resting on the back of the pick-up. 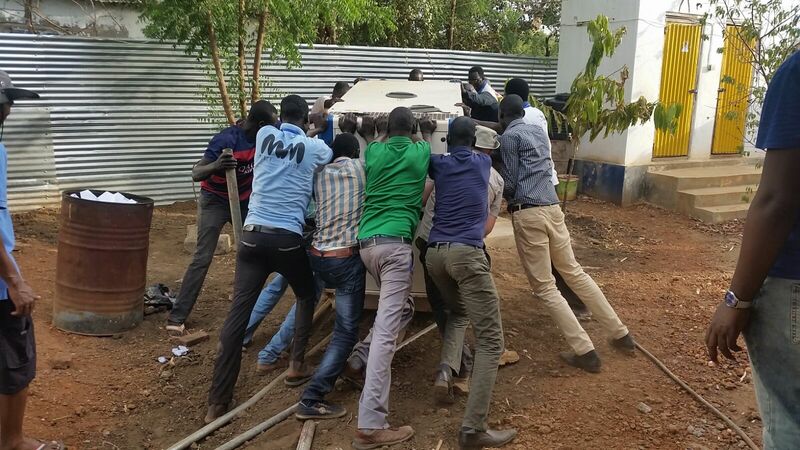 Then half the team would push and half the team would pull the generator onto the back of the pick-up. It was inch by inch, and at times no inch at all. The metal pipes forming the ramp were sttaining under the weight. All of us, pullers and pushers were straining too. 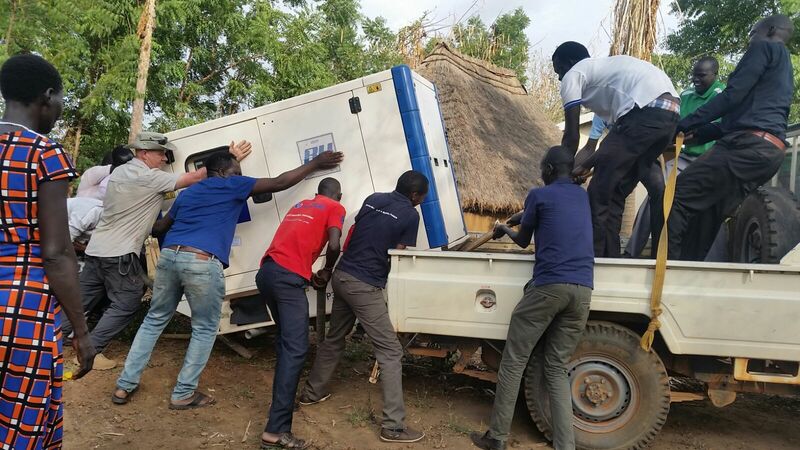 Yet after 20 minutes of effort and sheer determination the generator was sitting intact on the back of the pick up. We were half way there. I know from the pilgrimages I have walked that there is one thing worse that climbing a big hill and that is having to come down the other side. So now my mind shifted to the task of unloading at the other end. The pick-up could bring us within about 20 metres of our goal. The access point to the last 20 metres was narrow and the ground was uneven and rough. To a few men it would be daunting, but our blood and belief were up. There was a plan! The generator would be off-loaded from the pickup onto four lengths of metal pipe. These would act as iron wheels. It would require more pushing and pulling and shedding of sweat. Somehow it worked. It took another twenty minutes, but the generator was on its new concrete base - no injury to any team member and no damage to the machine and all with about an hour of daylight remaining. Now for those who want to consider a team building exercise I can recommned this Friday afternoon Generator Lift exercise.There definitively was a shared sense of joy at the achievement. But as I reflect on it the whole exercise was good for me becasue it revealed something to me about this group of men. They had waited until after 5pm when they would normally finish work, some even came in on their day off. It was in no ones job description to move this generator, yet everyone was willing to give time, energy and sweat. I could see that though it might have been my idea to move the generator - it was their generator. This is their project. What more could I ask for! As the person tasked with leading this team I know how crucial that level of shared ownership is - this is a team that pulls together - whether we are pulling generators or pulling a future of hope in this country scarred for far too long by war, poverty and corruption. I can dare to hope that we can move even bigger mountains!